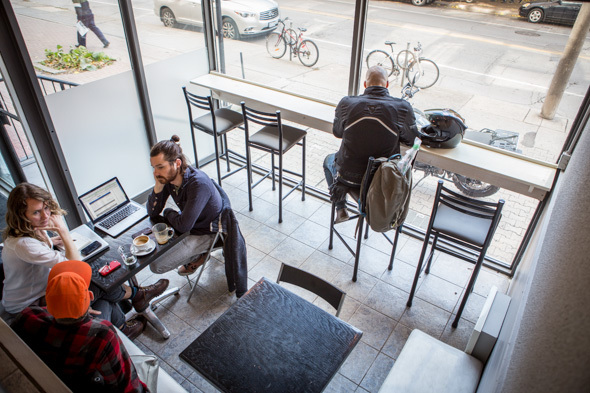 Bulldog Coffee, and its effervescent and snappy owner Stuart Ross, have had their fair share of ups and downs: Location changes , location closings , controversial stances on Wi-Fi (the shop has none) and what constitutes good service, and finally, a condo demolition and development that forced the most recent move. As Ross himself proclaimed when I went to visit him in his new spot, "I'm all drama." But for those who have come to love and depend on Ross's custom blend of beans and award-winning barista skills, don't you worry, because this Bulldog will not be put down. 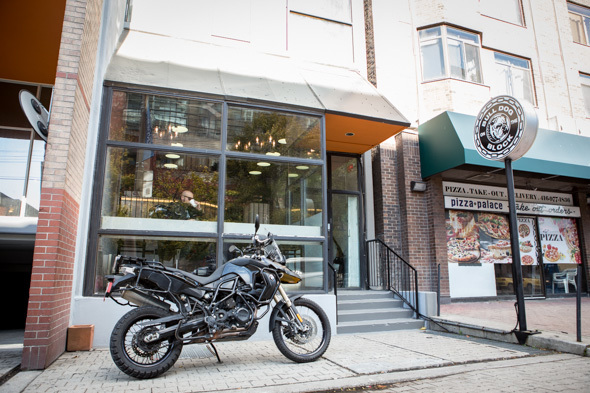 The new location is on Gerrard near Church, just south of the Village , which happily keeps him smack-dab in the middle of his long-time community. 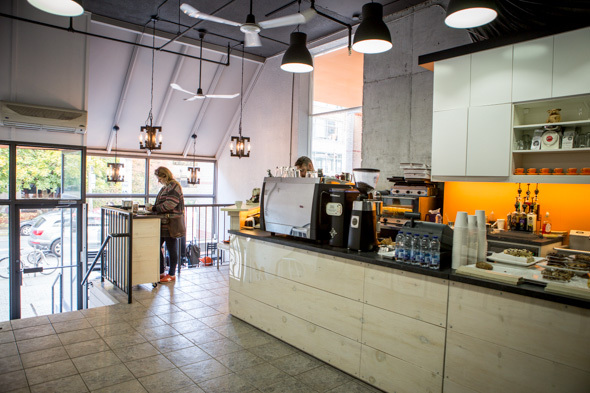 Ross took over the lease from a former print shop and began renovations in the summer; gutting the place, raising the ceilings, painted and creating what is now a striped back, open concept two level café. When I arrived Stuart had yet to hang all his framed accolades from over the years, but otherwise it already had that settled in, welcoming vibe. Not much else has changed on the Bulldog front. 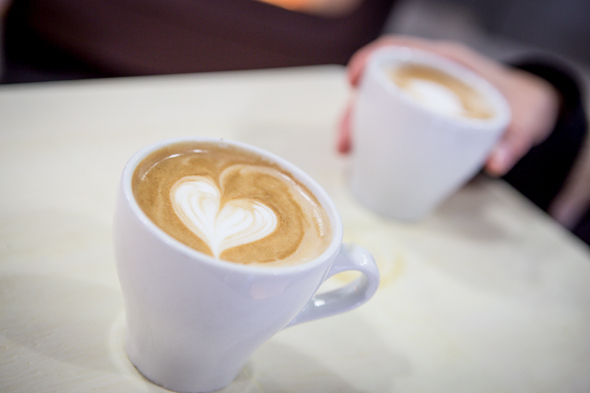 Ross still uses his custom blend of beans, created by Ruffino under the Classic Gourmet label, and he still uses a Simonelli machine to make up those signature Bulldog drinks (an espresso-based coffee, somewhere between a latte and a cappuccino for $3.50). His chalkboard menu is straightforward - lattes are $4, Bulldog cappuccinos are $3.50, Americanos are $2.50-$3.50 and espressos $2 or $3 bucks, depending on size and shots. The famous Bianco Bulldog - their white and dark hot chocolate drink (made using Ghirardelli) that you can made sing with a shot of espresso - will set you back $4.50. 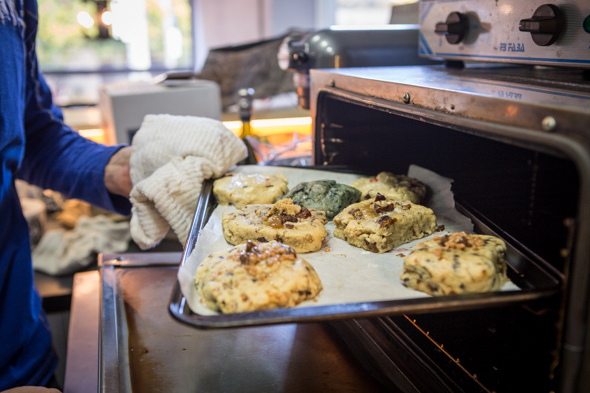 In terms of snacks, Ross bakes everything in-house depending on the mood, and that day he had croissants, brownies, squares (which flavours he described as savoury, chewy, salty and sweet), scones and two typed of biscotti. It's fun to watch Ross work his magic; he's passionate, committed, and a little bitchy. 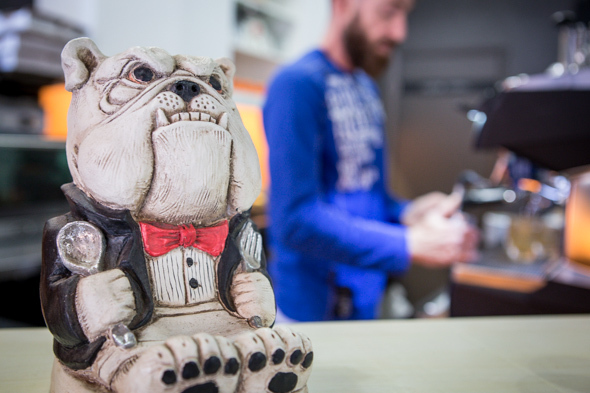 When I ask for an Americano, he told me that I should have a Bulldog - "it's my thing." Turns out he was right - it was delicious, creamy, smooth and mellow, and I had no complaints that he pushed me to try something new. He certainly knows how to play to his good side. With a new patio set for spring, and the same great product as the old Bulldog, Ross and his new location are sure to keep them coming in. 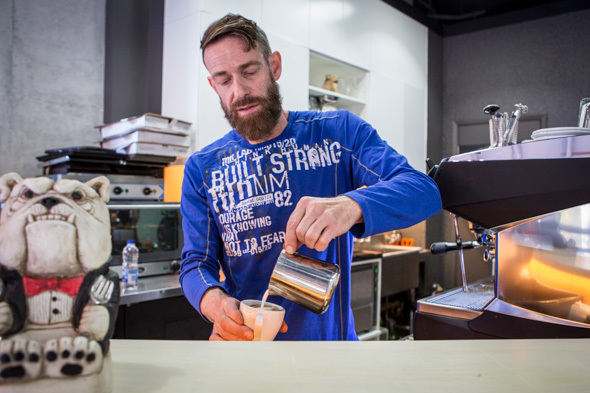 Plus, you can't disagree with Stuart's unofficial motto, stuck on the coffee machine: "Drink coffee - Do stupid things faster, with more energy."